“Working for Cascade Designs for three years has been a unique experience. We manufacture most of our product in the U.S. right here in Seattle. Karl, pictured below left, has been working in the outdoor sporting goods industry for more than 20 years leading product management and development for Marmot, Yakima, Confluence Paddlesports, Giro, and Yeti to name a few. 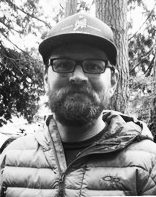 As Category Manager for Cascade Designs Platypus, SealLine and PackTowl divisions, he is responsible for creating the vision for each brand from product direction to retail presence. Karl’s passion for product development and his relationships with designers and retailers, speaks to his love of the outdoors developed from an early age when he was a boy scout. From his office in Seattle, we got to spend time talking with Karl about what we can expect to see from the brands at Outdoor Retailer next week. For 2019, we set out with a strategic three-year line plan for each brand and built upon that working as a team from marketing, design, to production. Around that, we created seasonal messages to serve the outdoor enthusiast with the best possible products and to ensure that they always can find what they want, where and when they want product. Starting with Platypus, our mission for 2019 is to offer the finest, taste-free, adventure-ready hydration and water filtration products on the planet. The 20-year old brand originally started making soft water bottles and hydration solutions to go from the city to the trail. Today, our number one customers are backpackers followed by campers and cyclists. We take enormous pride in the fact that 95-percent of Platypus’ branded product is made in our Reno, NV facility. With our own certified, world-class water lab that we share with MSR, we can research, develop and test various technologies to unequivocally say we manufacture the safest and most dependable filtration systems barre none. 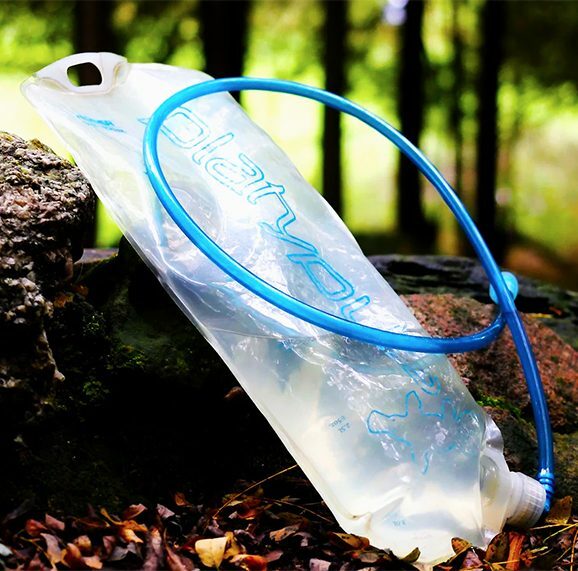 Best known for our collapsible soft bottles, hydration reservoirs and filtration systems, we are proud that we have the number one market share with our gravity filters. 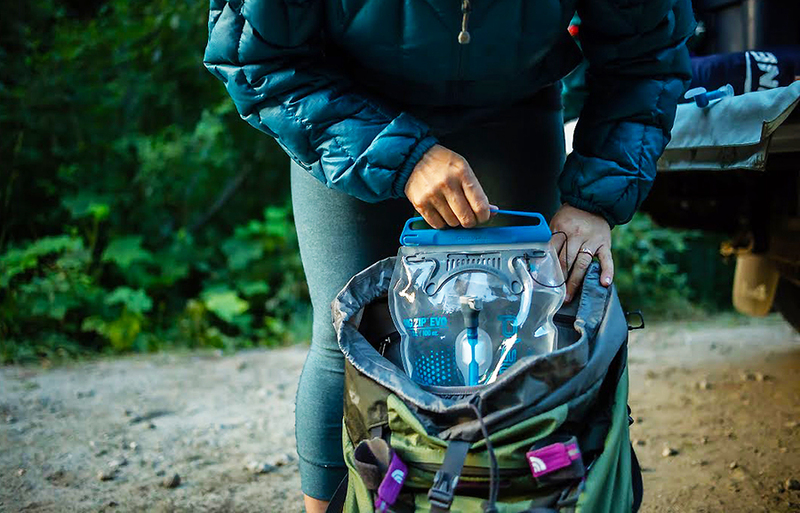 For 2019 we created an entirely new reservoir called the Big Zip Evo ideal for backpackers, shown in the lead image, with four different size reservoirs and 50-percent increase in water flow over last year’s model. With new user-friendly features like a quick disconnect for attaching the gravity filter directly to the reservoir, a new pincher for one-handed filling, we know it’s going to be a hit when we start shipping February 1. The Hoser, shown left, is our ultralight, minimalist counterpart to the Big Zip Evo and has always been a big seller for us. It now has 30-percent more flow than before, and we added new graphics. The retail price is lower and it’s easy to maintain. For packs, we haven’t had a hip pack in the collection for a long time. We’re introducing the Chuckanut Hip Pack which includes one of our soft bottles. It is very comfortable with a low profile to allow the wearer to carry essentials on a quick hour-long mountain bike ride. 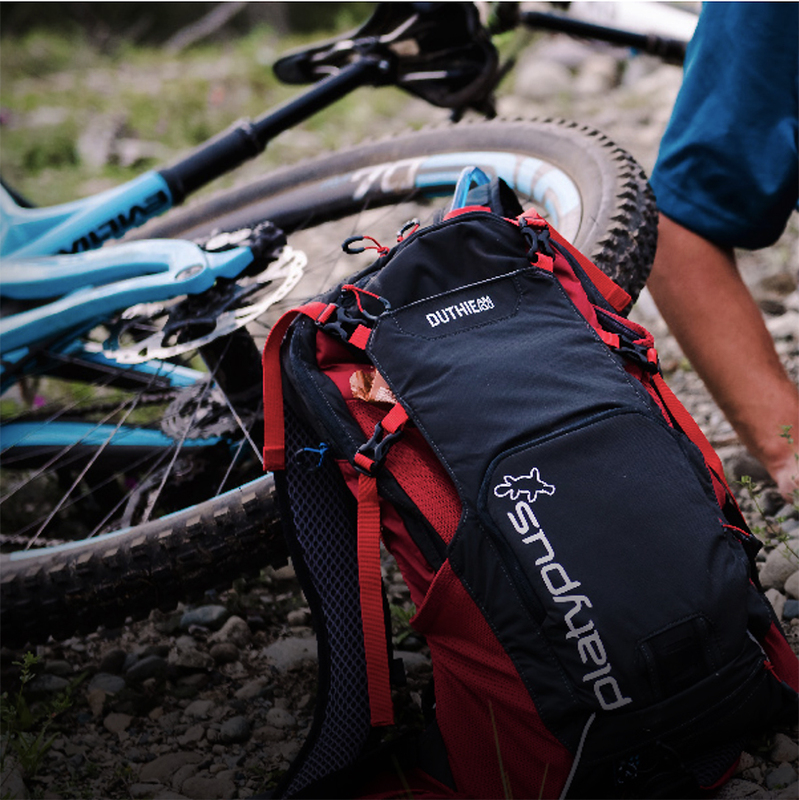 We also added new colors to both our All Mountain Series, Tokul and B-line packs. 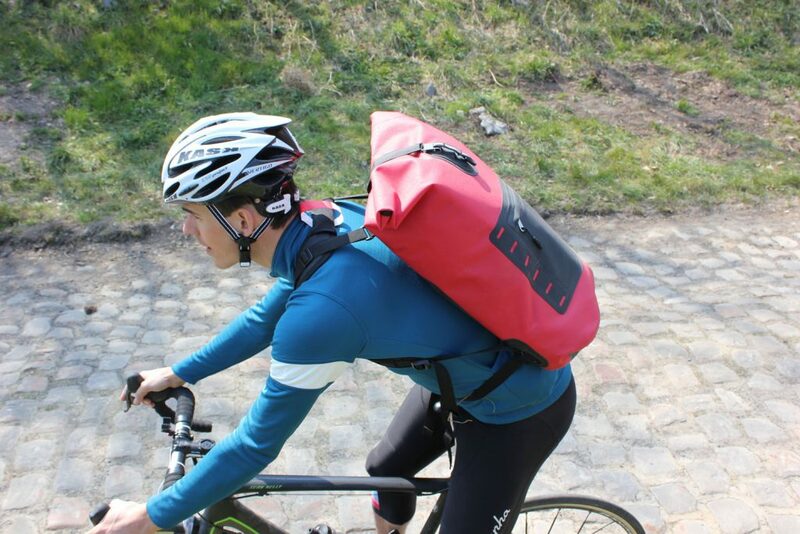 And a 12L size to the B-line and 15L to the Siouxon AM pack. All come with the Big Zip Evo. SealLine is the pioneer in waterproof protection. Developed for the maritime industry, SealLine waterproof bags were made to meet some of the most demanding standards of gear protection, performance and durability. Our mission is protecting your gear from the elements. The name represents the two-closure strips on the top of the dry bags. You fold those over and it creates a sealing line. That dual strip closure came around 1986 based on need and, at that point in time, we had the most waterproof roll top bag closure in the market. 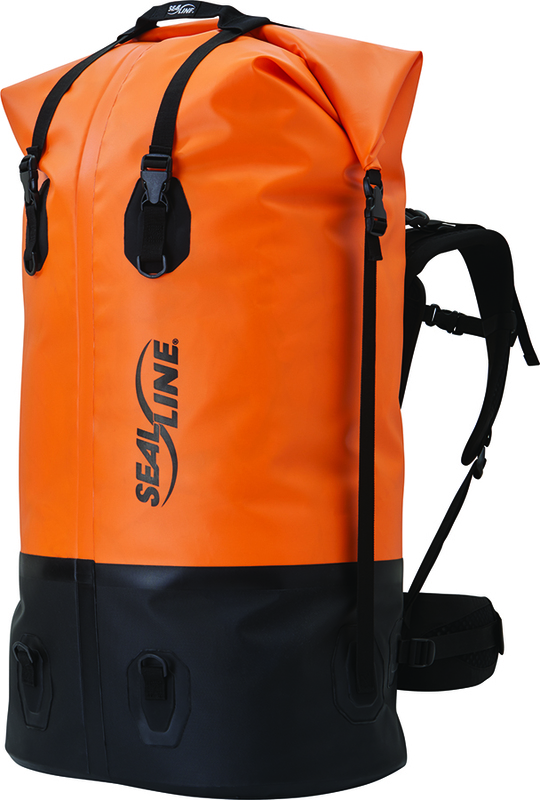 Approximately 85-percent of the line is made in the U.S.
At SealLine we have always made adventure-ready, best-in-class dry bags, sacks, packs, duffels, and accessories. For the most part, everything we make is welded even the dry sacks. Our competitors make the same claim, but the reality is that most times the seams are only sewn and taped. 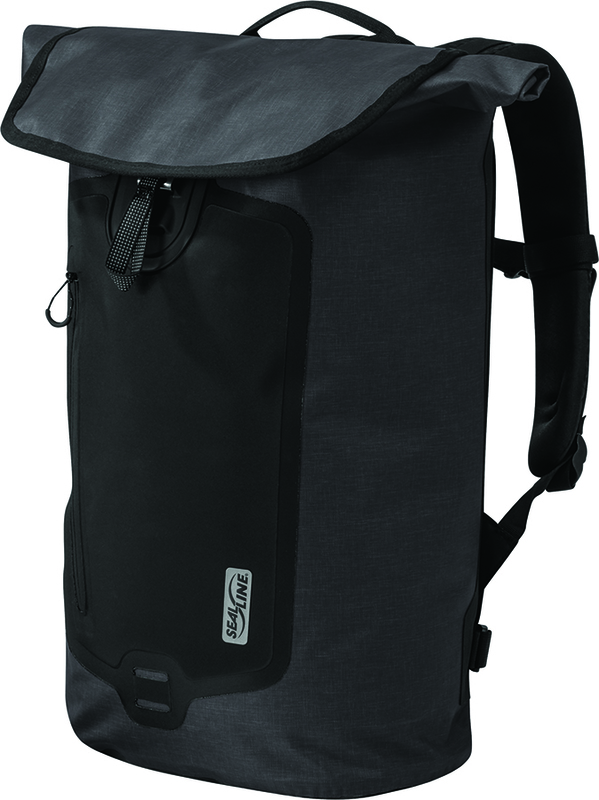 What you will see next week at OR that’s new for SealLine is a redesign of our backpack category. We’ve had large portage packs forever and it was time to update those designs. We now have a full-featured 120L Pro Drypack, shown left, for gear hauling or for full-featured adventure travel. 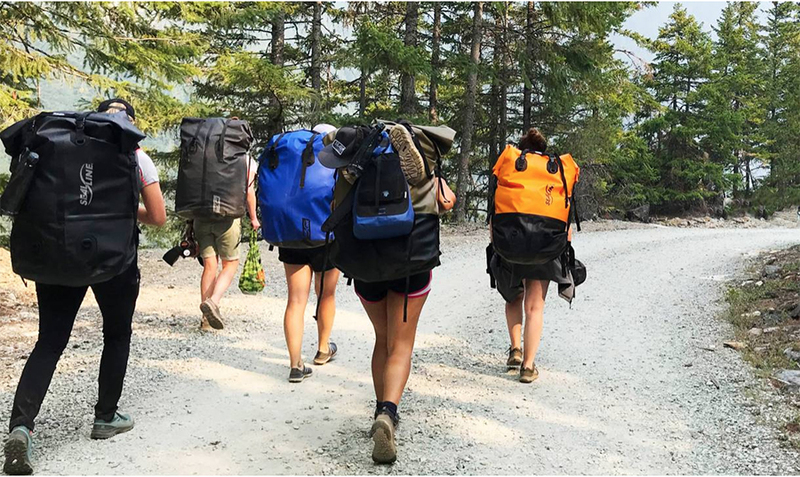 The pack has an adjustable suspension which includes a full-length frame sheet, adjustable torso length, comfortable/removable shoulder straps, and padded removable lumbar waistbelt. You can carry heavy loads without compromising comfort. Next is the Black Canyon Drypack an addition to our Boundary Drypacks. The packs all have improved suspension over what we had before and updated dry seal rolltop closures for making the sealing process easier. We focused this season on backpacks because the brand has been somewhat neglected over the years. We have been working on updating something in the category every season. For example, in 2018 we introduced new dry sacks — Blockers and Blocker Lights, (packing organizers), compression dry sacks and purge dry sacks. In 2017 we focused on our dry bags and introduced the Discovery Dry Bags and the Bulkhead Dry Bags. For 2019 we’re focused on backpacks. For 2020 and beyond, we’re not able to talk about that just yet but we’re touching every category and putting a lot of focus on the brand. One thing that’s new to the category is we’ve added a couple of day packs. We had large portage packs in the line and we had an urban backpack, but we didn’t have any paddle or travel specific packs. We have two new day packs this season. One is called the SkyLake Dry Daypack. It’s lightweight, waterproof, easy to roll up and has a really cool stretch mesh pocket on the front of the bag for stowing items for quick access. Minimal shoulder straps allow you to roll up and secure it. The bag is perfect for traveling. Then we have the Big Fork, a 30L backpack that’s fairly simple, highly durable, waterproof with a bungee system on the outside for quick retrieval of things that you need. Lots of lash points — you can strap it on the deck of a paddleboard or up on your kayak. It’s great for adventure travel. It also has a nice seal top closure. We’ve had a bicycle commuter backpack for awhile called the Urban pack. We updated that so we have the 16L Urban Daypack, shown right. One of the great things about this is we’ve added a laptop sleeve, internal pocket, entirely new harness system, nice back pane with mesh and foam so it’s off your back, and it has great breathability. It also includes a light attachment and various reflective hits on it for visibility. I’ve been testing it out on my workouts for the last year and really like it. Pack Towls are the original microfiber outdoor towel that stows easily in your pack or travel case. For decades microfiber expertise has enabled us to involve the simple idea of a towel to a go anywhere companion. 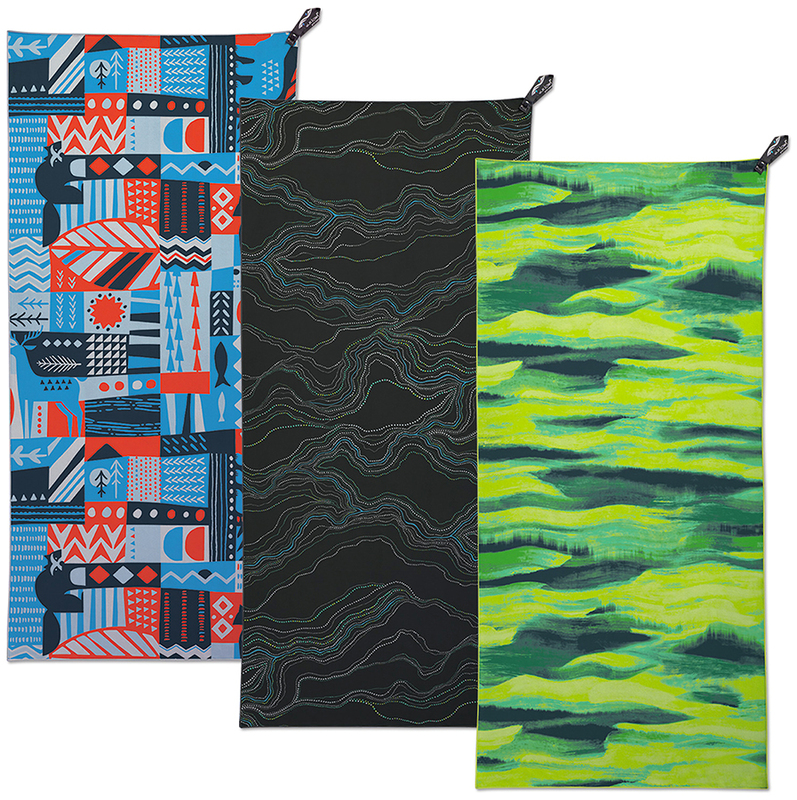 We have five different models of towels all with specific uses. They absorb eight times their weight in liquid. They’re highly absorbent and quick drying so they’re perfect for travel. The important thing for PackTowl is we want a fresh towel whenever, wherever. We work with Polygiene, which is antimicrobial, but we want the colors and graphics fresh. The graphics are becoming super important for this brand. Every season we keep the designs playful. We have the number two market share. Globally we have number one market share. Our towels go from light weight to heavy weight.